Let’s be clear about one thing. Egg nog this is not. It’s less rich, not so cloying, lacks hard-and-fast rules about a shower of nutmeg, and doesn’t flirt with the potential for a nasty salmonella situation. As such, it’s eminently easier to quaff than nog. It’s a lot more like a milkshake. The only problem, as we see it, is ever returning to a straight-laced, teetotaling vanilla version. That, and achieving anything of import after starting to sip it. 1. Combine the milk, bourbon, vanilla, simple syrup, and ice cream in a blender for about 8 seconds. Pour into cups or mugs or glasses of some sort. Sprinkle with the nutmeg or cinnamon, if desired. 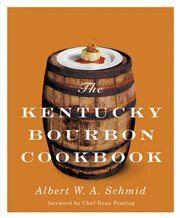 Bourbon Milk Punch Recipe © 2010 Albert W. A. Schmid and Dean Fearing. All rights reserved. All recipes and photos used with permission of the publisher.